With the R2 2017 release of the UI for WPF suite we have introduced the brand new Material Theme. It comes with built-in elements that provide interaction feedback, with easy-to-customize colors and Material design drop shadows with beautiful and smooth transitions between the states. The Material Theme has one color variation, but it is designed to be easily modified via the exposed colors in the theme palette. Furthermore, the introduction of the MaterialAssist helper class makes it easier than ever to modify appearance-related properties directly in the instance of the control without the need to extract and modify the default control templates of the basic controls. They are used for backgrounds, non-intrusive interaction states, glyphs and icons, borders and separators, text. MainBrush: White by default and it is mainly used as background of the controls. PrimaryBrush: This brush is very light gray by default and it is used as secondary background color (background of RadDocking, CarouselItem). AlternativeBrush: A slightly darker gray brush that is used for the Mouse Over states of buttons, button-like controls and ListBoxItems. It is also used as a background in the RadRibbonBackstage and PrintPreview controls and dialogs. ComplementaryBrush: Even darker gray brush that is used for the Pressed states of the buttons, button-like controls and ListBoxItems. DividerBrush: A black brush with 12% opacity that is used for borders and separators. It is transparent, so that it could allow for the background color to pass through since it is very light grey. DividerSolidBrush: This is a special brush that is the solid color variation of the DividerBrush. It is calculated by overlaying the DividerBrush on top of the MainBrush. It is created for scenarios that the border or the separator should not be transparent, because it overlaps with other borders, lines or separators but should be the same color as the DividerBrush. 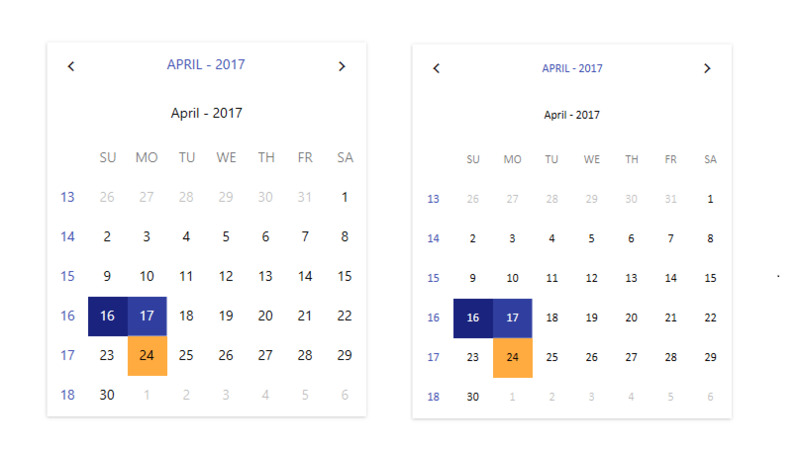 It is used in controls which have stacked lines on top of each other like RadGridView, RadScheduleView, RadPivotGrid, RadPropertyGrid. MarkerBrush: A standard black brush for the text elements. MarkerInvertedBrush: A white brush for text elements that are on a dark background. IconBrush: A black brush that is used for the icon paths and glyphs when they are on light backgrounds. It is often combined with opacity to achieve the desired shade of black. PrimaryNormalBrush: By default, it is blue (indigo) and is used for coloring the primary accent elements - headers, important, selected or checked elements (RadListBoxItem, RadToggleButton, checked CheckBox background), slider thumbs etc. PrimaryHoverBrush: Variation of the PrimaryNormalBrush that is used for the hovered states of primary accent elements – raised/flat buttons. PrimaryPressedBrush: Darker blue than the previous two brushes for pressed states of primary accent elements – pressed RadToggleButton/RadRadioButton, pressed state of raised/flat buttons. PrimaryFocusBrush: Light variation of the indigo color scheme which is used as a main brush for backgrounds and underlines, indicating focused states, as well as selection and dragging layovers – underlines for the input controls in focused states (TextBox, RadNumericUpDown, RadWatermarkTextBox etc. ), backgrounds in normal states of buttons, RadListBoxItems and similar, focus halos for CheckBox and RadioButton. AccentNormalBrush: Bright amber-orange brush used as a background for the secondary accent element (RadScheduleView’s Appointments, RadGanttView Summary containers), hover state for checked/selected elements (selected RadListBoxItem hover, checked RadToggleButton hover), tab items focus underline (focused RadTabItem, focused LayoutControlTabGroupItem, selected docked RadDocumenPane), RadDiagramShape fill, RadDocking’s selected docked/undocked pinned RadPane/ToolWindow. AccentHoverBrush: Lighter variation of the amber color for the elements that have AccentNormalBrush as a background in their default state (RadScheduleView’s Appointments, header buttons in selected RadPane/ToolWindow in RadDocking), RadGridView frozen columns splitter, checked CheckBox and RadioButton, RadDiagramShade stroke. AccentPressedBrush: Darker amber color for the pressed/selected states of secondary accent controls - RadScheduleView’s Appointments, pressed or checked CheckBox and RadioButton, pressed states for header buttons in RadDocking’s RadDocking’s selected docked/undocked pinned RadPane/ToolWindow. ValidationBrush: A bright red brush used for indicating validation errors - for the underline of the invalid control and as a background for the error tooltip, background for invalid rows and cells as well as for clear buttons' mouse over states. RippleBrush: A white by default brush which is used for the ripple effect of the MaterialControl. By itself it is a solid color, the opacity of the ripple comes from the MaterialControl’s RippleOpacity property. When using the Material theme you can dynamically change the FontSize and FontFamily properties of all components in the application the same way as you do in Windows8, Windows8Touch, Office2013, VisualStudio2013, Office2016 and Green themes. The FontSize and FontFamily properties are public so you can easily modify the theme resources at a single point. The most commonly used font size in the theme is with value 14 and can be modified through the MaterialPalette.Palette.FontSize property. The default font used in the theme is Roboto. For complex scenarios we strongly recommend setting the FontSize property only before the application is initialized. Also, we recommend values between 11px and 19px for it. The Examples 2 and 3 show how to change the default FontFamily from "Roboto" to "Calibri" and the FontSize from 14 to 12 on a click of a button. The Material Theme uses and supports the same approach for adding icons and icon-like images introduced with the Office2016 Theme. Instead of images or paths we are using a font of glyphs by default. The TelerikWebUI font provides over 400 scalable vector glyphs that are available for use to our clients. You can read more about the usage and range of the new glyphs in the Font Glyphs Overview article. Example 4 show how to merge the font resources. Example 10 in the Material Control section shows the usage of a glyph in a TextBlock. The Material Theme exposes an easy way to modify the corner radius of many elements in your application. You can directly use the corner radius property of the palette. By default the CornerRadius value is 2 as shown in Example 5. Example 6 shows how to change the default corner radius from 2 to 10. Note that you don't have to explicitly change all 5 corner radius properties as they will inherit the value from the CornerRadius main property. FocusBrush: Sets the value of the background Brush applied when the element is focused. IsShadowDisabled: The property is used to control the visibility of the shadow effect. MouseOverBrush: Sets the value of the background Brush applied when the mouse is over the control. PressedBrush: Sets the value of the background Brush applied when the control is pressed. ShadowDepth: Enum property that indicates the depth of the shadow effect over the control. There are 5 values that can be selected. CornerRadius: Used to set the corner radius of commonly used basic controls that could need corner radius customizations but don't expose such property by default (e.g. Button, RepeatButton, ListBox, RadComboBox, etc.). Example 11 shows how to set corner radius to a default Button element. The Shadow is one of the newly introduced elements designed specifically for the needs of the Material Theme. It is used to add a shadow effect around another control or element. The Shadow element is not intended to directly host other elements as the WPF drop shadow effect affects any nested texts and results in blurry characters. If you would like to use it separately in your application, you should work with its Width/Height properties so that it appears around the desired element as shown in Example 9. The Shadow element should have a background set for the effect to appear. The element exposes a ShadowDepth enum property which takes one of the following values: Depth5, Depth4, Depth3, Depth2, Depth1, Depth0. The larger the depth number is the stronger the shadow effect will be. Figure 5 shows the effect that the shadow element adds around a TextBlock element. IsRippleEnabled: Indicates whether the ripple effect is enabled. IsRippleCentered: Controls the initial position from where the ripple effect starts. Setting the property to true will cause the effect to always start from the center of the control. Otherwise, the cursor position is respected. IsSmartClipped: Sets whether the ripple should be within the boundaries of the corner radius. RippleBrush: Sets the brush used for the ripple effect. RippleOpacity: Sets the opacity of the ripple effect. Note that the MaterialAssist.MouseOverBrush and MaterialAssist.PressedBrush properties, which are responsible for the mouse over and pressed animations, are automatically bound to the templated parent. It is possible to disable the ripple effect of the MaterialControl through a style. Example 12 demonstrates how this can be achieved. The style can be included in the scope of the Telerik control(s) whose ripple effect needs to be disabled.